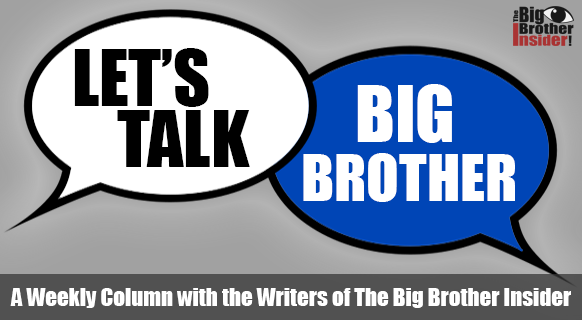 Welcome to a new weekly column featuring the writers of The Big Brother Insider! Join writers; Kaitlyn, Taylor, and Ashley as well as TBBI owner, John every week for their thoughts on BB18! 1) What is your thoughts on it being Week 4 in the game, and this being the first time a veteran is on the block? John: I think it being the first time a vet has gone up, speaks for the season. The newbies are awful at this game, in my opinion. A vet should have gone up, if possible, the first or second week. It being Week 4 and Da’Vonne being the nominee just doesn’t make sense to me. Nicole would have been a much better target, considering Frank is safe this week. I’m surprised that it’s taken this long for one of them to go on the block. Kaitlin: For it to be Week 4 and a veteran is on the first time, is surprising. Normally the newbies want to target all the veterans within the first couple weeks. This season, that was not the case. The veterans have an advantage with the teams and it also helps that they recruited some newbies into a majority alliance. We all knew a veteran was going to go up eventually and I’m honestly not surprised it is Da’Vonne. Ashley: It’s kind of surreal to me that this is the first time a veteran has been put up on the block. It’s even more surprising to me that the first veteran on the block is Da’Vonne! I thought for sure these newbies would be taking a shot at Frank or Nicole the first chance they got. I’m not surprised to see Da’Vonne up there because the way she has been playing this game, it was going to catch up with her eventually but with three nominees every week, I expected one of the other veterans to be sitting up there sooner. Taylor: I'm surprised this was the first time a veteran had been up on the block! I'm not surprised at all it was Da'Vonne, she always causes some sort of a problem in the house by fighting with someone instead of attempting to be a little more relaxed like Nicole, and James. I like Da, I wish she would've toned her game down this time around. 2) Let’s re-ask this question from two weeks ago, who do you think is playing the best game right now? John: Two weeks ago I said Michelle and Zakiyah were playing the best games, and I still believe this. Many will laugh at this and say, “Michelle and Zakiyah who? !” and that’s exactly the point. I feel that they’re not anyone's targets right now. Although their under the radar game play isn’t one we enjoy watching, it’s still a great move that is (and will continue to) get them far. Kaitlin: Two weeks ago I said, Da’Vonne. Why? Because I saw major improvement compared to her season. But as of right now, I have to give James the props he deserves. He’s laying low with the drama and playing an excellent social game. James is playing the smartest game out of all the other houseguests. The best move he has made by far is using the phone to warn Natalie about the Roadkill winner last week, it was clever idea and a smart move to gain her trust. Ashley: Is no one a proper answer? Just kidding. . . sort of. I think Paul is actually in a really good spot right now. James as well. They’re both well liked by pretty much everyone in the house. Paul may go up on the block week after week as long as the Team Twist stays in effect but I think there will always be someone else up there the house is looking to evict. I don’t see anyone putting James on the block anytime soon. Taylor: I think Paulie is really intelligent and playing a great game. He's aligned with a good group of people and even though he can be a little sassy sometimes, he's a strong player: both competition and social game wise. 3) To go off the last question, who do you think is playing the worst game right now? John: I think everyone is playing and awful game. Nobody is thinking strategically, voting out Bronte last week proves that. Last time I said Frank last time, and although I think that is still true, I think Nicole is playing the worst game right now. I say Nicole because she is literally repeating her game from BB16. She’s letting a showmance distract her and her decisions. By doing so, I think that’s going to end up putting her in a bad position in the house. She’ll become a bigger target than she would have been otherwise. Kaitlin: Last time I said Tiffany, her head was not in the game. But I guess it just took some time for it all to click. Right now, I would say Nicole is playing the worst game right now. Being a super Nicole fan, I’m extremely disappointed. I don’t think she’s really playing the game, instead she’s making the same mistakes as last time. She’s getting wrapped up in a showmance and it is making her an even bigger target. Nicole, get your head in the game and kick Corey to the curb. Ashley: So many people are playing terrible games right now but I guess that makes good TV! Da’Vonne and Tiffany come to mind after this week. I think they’re both so fixated on getting certain people out or disliking people, they need to be focused on the end game and half a million dollars. I hate that they let so much drama cloud their vision. I’m also really disappointed in Michelle after this week. She’s never been my favorite but a few days ago I might have said she was playing the best game. Now it seems like her hatred for Tiffany has taken over and she can’t focus on anything else. Taylor: Da'Vonne!!!! Poor girl just can't stay away from the drama. I understand it's hard not to be mad at Frank, and it's hard for Tiffany and Da to get along, but in this game, a fight or even just a small disagreement can get you backdoored. If only she could've bit her tongue a couple times and just walked away. 4) Who do you want to see win the Battle Back Competition this week? Glenn, Jozea, Victor, Bronte, or this week's evicted houseguest? John: First, I hate when they bring people back. To me, when you’re evicted that’s it. Yes, I love the entertainment. I love it when someone comes back in and wrecks havoc, however that rarely happens. Most of the time re-returnees fall victim to the “revolving door” phenomenon, where they’re just evicted the same week they return. So to me, bringing someone back is pointless. However, if I had to choose someone I’d like to see back, for entertainment it’d be Jozea. Many people are saying Glenn but I think that too much game has happened for him to be able to do much of anything worthwhile. At least with Jozea, we’re sure to get entertaining feeds for the week. He is the messiah afterall. However, If Da’Vonne or Tiffany is evicted this week I’d like to see them return as well. Whenever the person they just evicted comes back in, that often brings entertainment as well. Kaitlin: That’s a really tough question. Maybe I’d want to see Bronte or whoever is evicted this week. I want to see someone come back into the game and play fearlessly. Someone needs to start making big moves and really stir up the house dynamic. Last week we saw our first house flip and we need every week to be just as exciting. Ashley: What’s best for TV is probably the latest evictee coming back into the house. I think that would by far create the most drama. I honestly don’t really care for any of the people already voted out so I guess I’ll say I’m pulling for the underdog on this one, Glenn deserves a second chance. I’m not sure he would really effect the game all that much and I’m not even sure if he would be entertaining. I do feel bad about the way he went out though and the fact that he’s been sitting in sequester this entire time with probably no chance of getting back in that house. Team Glenn. Taylor: Whoever is evicted this week for sure. Whether it's Tiffany or Da, they can stir things up which I appreciate. But if not, I really wouldn't mind seeing the underdog, Glenn, or Bronte. I really wasn't too fond of the "Spy Girls" alliance but I think Bronte is genuine and would make some better game moves. We hope you enjoyed hearing our opinions, but we want to know, what do YOU think? Soundoff your opinion in the comments below! Also, do you have a question you want us to answer next week? Submit it to us on Twitter or in the comments!